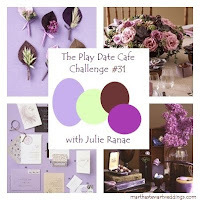 It's time for another great color challenge at The Play Date Cafe! This week Julie chose the colors Purple/Lavendar, Light Green, and Brown to work with. I had lots of ideas running through my mind with this weeks colors, and thought the new Bloom and Grow Plate from Artistic Outpost would be just perfect for this weeks challenge. For the Brown, I used some wonderful papers from the Shabby Chic Collection by Tim Holtz, adding the stamped Bees in Chocolate Chip ink. The seed packet was stamped in Black on Watercolor paper, I added the stamped image of the flowers, then stamped them a second time on a scrap piece of paper. The images are colored using the Marker Watercoloring Technique. I colored the flowers from the scrap paper, and popped them up on dimensionals over the first image. Here's this weeks Color Story Photo Light Green, Brown, Lavendar/Purple. We'd love for you to play along with this weeks challenge at The Play Date Cafe, you can find all the details here on how to enter. Beautiful card Lisa! The purple flowers are so rich & elegant - seem to pop right off the card! Gorgeous card Lisa! I really love the old fashioned look of it, it would be a perfect card for a grandparent or someone that loves gardening. Fab! Wow, this is gorgeous, Lisa! Fabulous card! Lovely flowers and love that you layered them. (I was inspired by that and used it on my tag card yesterday after I saw your project.) Beautiful background, love that you stamped the bees in the background. Your cards from Artistic Outpost have been lovely!! All week! Sweet, luv how the flowers just pop off the page! Colors are great and the use of the bee in the bg belongs there! This is gorgeous! I love the vintage look and your flowers are just beautiful! Absolutely gorgeous Lisa! Love how the flowers just pop and as usual great coloring! Also love what you did with the background paper! I love the idea os the seed packet design!! Just beautiful, Lisa! The flowers are gorgeous and love the background, too!! Lisa this is beautiful, I love this color combo!! Lisa- this is GORGEOUS. Beautiful use of the Marker watercoloring technique - and the colored flowers popped up are a great addition too! TFS and thank you for your help tonight! This card is super pretty! 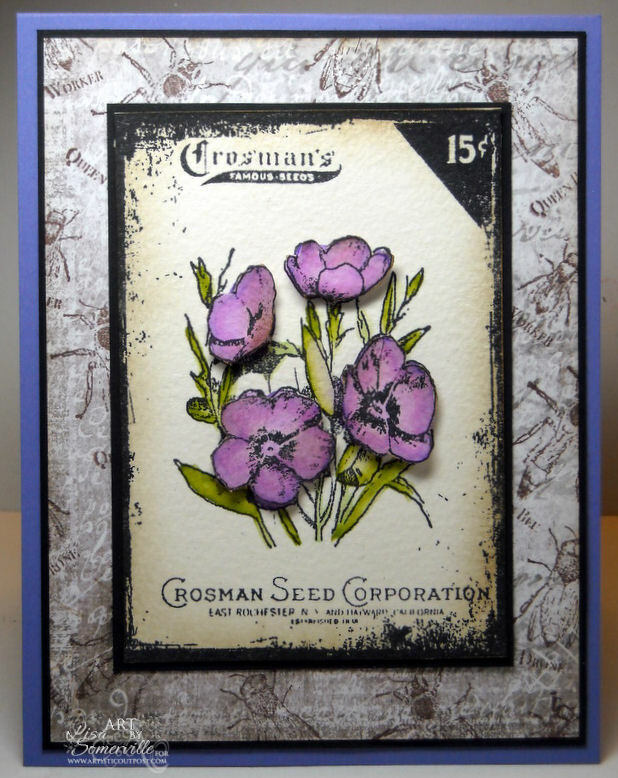 I just love all your stamping and how you create--such a wonderful card:) YOU are SUPER TALENTED!